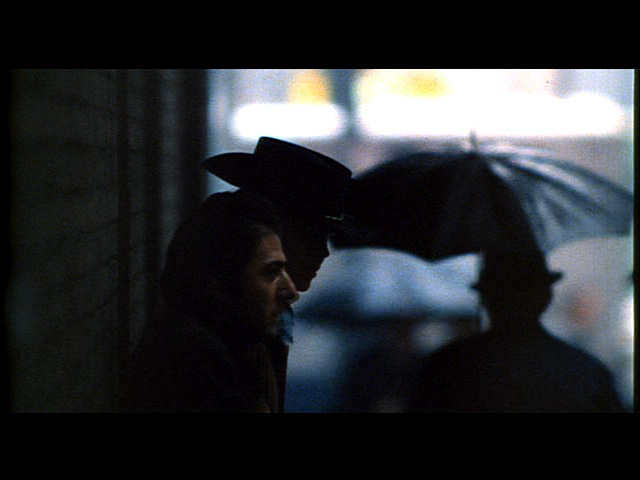 I'd heard of Midnight Cowboy (1969) from friends of mine but, as with all the AFI films I'm watching, didn't know what to expect. There's a saying about poetry, which is that all poems are love poems. I'm starting to wonder if that isn't true about all films, or at least all good films. The love of friendship, especially between two men, is difficult to portray. I'm not sure why that's so. Maybe it has more to do with the American audience. Men in this country and culture--from my inexperienced point of view (never having traveled)--feel there's a stigma attached to showing love and friendship to another man. That's changing, I'd like to think. I enjoyed Jon Voight's performance quite a bit. Acting naive isn't nearly as easy as it looks, and Voight pulls it off well. He's a good ol' boy, despite his chosen profession, and it's his humanity that warms the film throughout. 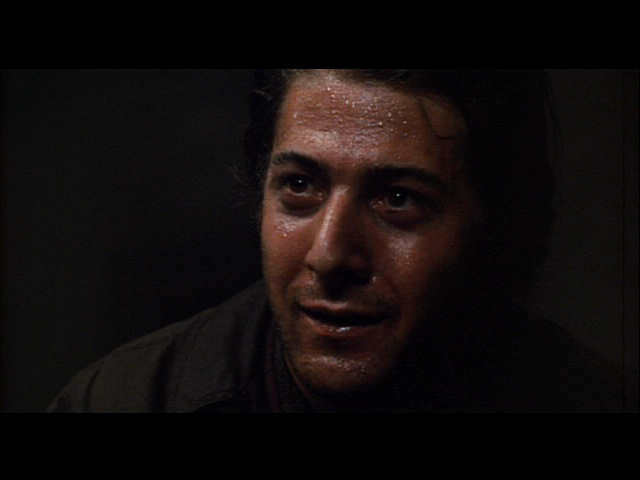 Dominating, however, is Dustin Hoffman as Ratso Rizzo in what has become a caricatured performance. But Hoffman is anything but one dimensional. His is a Pagliacci performance, making the viewer unsure whether to laugh, cry, feel sympathy or be revolted. Neither of these characters is very bright, and so the seemingly effortless portrayal by two intelligent actors is inspiring. I'd hesitate to say what the movie's about. I'm sure it requires a few more viewings. During the first half hour, which is mostly character exposition, I thought "Well, they're not being very subtle." That was fine as, like Easy Rider, there's no need. But I was caught off guard. The subtlety snuck up on me. By the end, I knew I'd been suckered in as much as Vaughn's character is by the street-savvy New Yorkers. 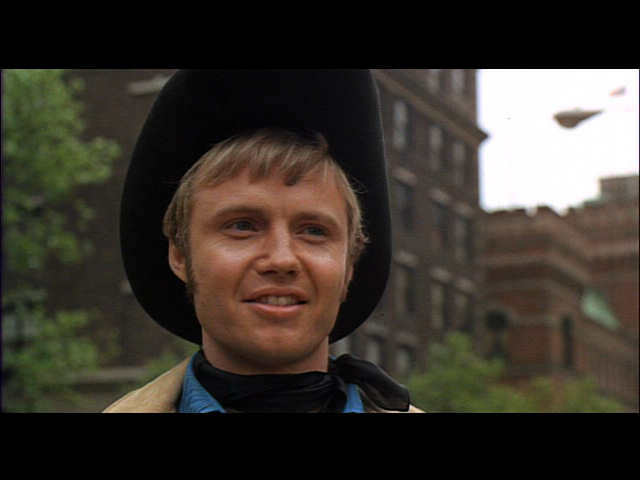 Jon Voight, cowboy in New York. 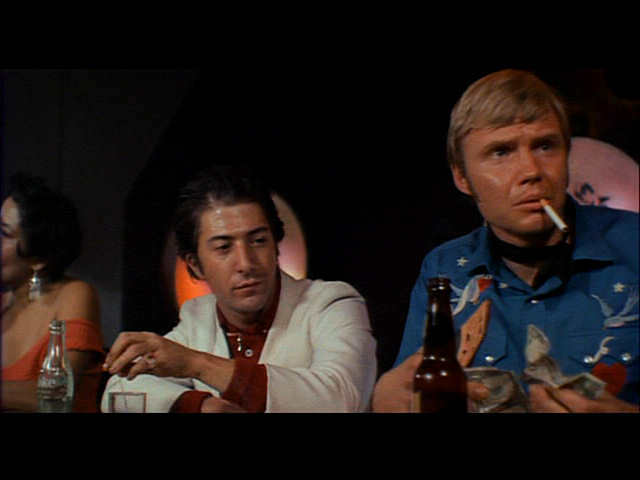 Dustin Hoffman and Jon Voight. Notice where Hoffman's attention is. There were just enough shots like this to provide complex atmoshpere. Tremendous work, because Hoffman doesn't overdo it.